In making "Faith and Doubt at Ground Zero," FRONTLINE set out to explore whether, and in what ways, Americans' religious beliefs and unbelief have been challenged or deepened as a result of Sept. 11. We decided it would be interesting to ask visitors to this website the same underlying questions. 1. Do you consider yourself a person of religious faith? A. Yes, I am a person of faith. B. No, I am not a person of faith. D. I would rather not answer. 2. If you ARE a person of religious faith, did the events of Sept. 11 cause you to doubt your faith? Or did Sept. 11 have the effect of strengthening/deepening your faith? A. Sept. 11 caused me to doubt my faith. B. Sept. 11 strengthened and/or deepened my faith. C. Sept. 11 had no effect on my faith. 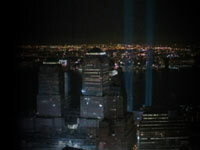 Did you feel spiritual aftershocks in the wake of Sept. 11? Share your personal stories of faith and doubt, belief and unbelief, in a special discussion area we've set up as a companion to this poll. 3. If you ARE NOT a person of faith, did the events of Sept. 11 cause you to question your unbelief and/or lack of faith? Or did Sept. 11 strengthen your unbelief and/or lack of faith? A. Sept. 11 caused me to question my unbelief and/or lack of faith. B. Sept. 11 strengthened my unbelief and/or lack of faith. C. Sept. 11 had no effect on what I believe or do not believe.